Course records abounded at the 2016 Mineral Creek Half Marathon. Lynass family sweep, with Spencer in 1:18:00 and Nicole in 1:36:18. They both picked up hoodies, and Spencer cashed in on the time bonus for breaking 1:20. Their fast times came amidst a record turnout of 41 finishers. This year's event featured visitors from Scotland, Canada, and four states in addition to Alaska. 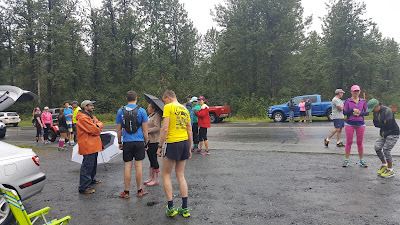 Wendy B traversed the hills and endured the rain to finish her first half marathon ever. Kyra cut 16 minutes off her time from last year. 2011 winner Alf contributed his skills at the start and finish. Thanks to Devin for providing a pick me up at the turn around. Picture credits to Chloe and Cam. Results, followed by more pictures.